Unlike other personality tests, the book not only helps you understand your character traits, but also explains the core values of the nine different personality types featured in the book. The authors also explain common weaknesses of each personality type. For the Achiever, common blind spots include being a workaholic and difficulty accepting failure. The book’s last section includes job hunting tips, which job seekers might find valuable when brushing up their resume, interviewing, or networking skills. It’s never too early or late to find your true passion. 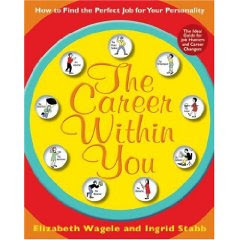 For those of you who are discovering a new career that matches your interests, Elizabeth Wagele and Ingrid Stabb’s book, The Career Within You, is a quick, easy, and effective place to start. Sounds like a book every high school guidance counselor should read. I wish mine had! Enjoyable post.Glad I did.My comment is that it seems like it is “either/or” between the the two models presented. I find that truly successful leaders must have qualities from both sides of that list, so I would push back a little. Hmm, I haven't read this book, but your brief description makes me wonder about it. I agree that your personality (enneagram) type does provide you with a specific set of talents that might be suitable for one job more than another, but I also believe that many jobs can be done with many different sets of talents. What's important, of course, is realizing your own talents and your own non-talents and balancing yourself accordingly – by working with people with the talents you lack or simply working to temper your own natural talents with work to develop and reveal others. So I worry about a book that says you must be an Achiever to be a good CEO, or that all Acheivers make good CEOs. It's a good place to start, but not the final word by any means.